This recipe is adapted from one perfected at Greens restaurant in San Francisco. The crust is crunchy on the outside but also chewy. I think it's wonderful. I'm going on a pizza making journey and this is stop one. If you've never made your own pizza dough before, it's easy and fun. This recipe makes 2 12-inch crusts. More to come! In a large bowl, dissolve yeast and sugar in warm water and set aside for 5 minutes until foamy. With a large spoon, stir in the olive oil, cornmeal, flour and salt. Soon you'll have a workable dough. Turn the dough out onto a lightly floured surface and knead for 5 minutes. If you haven't kneaded before, essentially you fold the dough over and the push it down into the surface till it flattens a bit, then fold and repeat. Sprinkle flour on the surface as needed to keep the dough from sticking. When done, put the dough in a lightly oiled bowl and turn it once so the surface of the dough is covered with oil. Then cover the bowl with a dish towel or plastic wrap and let sit and rise in a warm place for 45 minutes. It should about double in size. Then punch the dough down (hit it in the middle repeatedly with your hand in a fist), fold it over tightly and form it into a ball. Then let it rise for another 30 minutes. The dough is now ready. It can keep overnight in the refrigerator and also freezes well. If you want to refrigerate or freeze, punch it down, fold it, and cover tightly with plastic wrap. Bring it back to room temperature before rolling it. When warm, form into two balls of equal size and roll out into two 12 inch pizza crusts. I make my own dough all the time, yours is similar, once you make homemade dough there's no turning back...your pizza looks fantastic! The recipe looks good John. I have been making my own pizza for more than a year now and there is no turning back. I like to make it in the mixer and then put it in zip lock bags and let it rise in the fridge. Then I have dough ready to go for a fast meal. I make the dough on the weekend and we have dough for the week. This one looks so good! Thank looks very good John. I will try this recipe the next time I make pizza - I do love to make my own crust. Thanks for a great post! How could any of the reviewers attempt the recipe since there is no unit of measure given for the water, just 1 1/3.......what? John, I hope reviews on this site are made by people who make the recipes themselves, not just those who say, "Gee, the picture looks great...5 hearts!" That system makes any of the ratings here seem suspicious. Ummmmmm one and one third cup of water is very clear to understand. I'm worried that there is a chef out there that doesn't understand a 1 1/3 cup measurement. The recipe I'm looking at states 1-1/3 cups of warm water. Sounds super easy, i will surely give it a try this weekend, One question 500F should be good? I mean its too high, what would you suggest..Both the toppings and sauces sounds amazing.. I'm always looking for a good pizza dough recipe. I usually give up and buy it at the local Top Foods. I'll give this one a try. It looks perfect! I liked the cornmeal addition. I bake gluten-free, and next time I make my pizza dough I am going to mix it up a little and try a blending of our recipes. Thanks for the friend add. I am looking forward to trying some of your recipes (altering to gluten-free of course). Perfect! I have been looking for a good pizza crust recipe. No more ordering in pizza! This is better! I am looking for a new pizza recipe and this sounds really good I will post after I make it. John, I have to tell you that I tried this recipe for pizza dough the other night, and OMG was it ever good! My husband and I don't care for thick, doughy pizza crusts, so this was just perfect. My husband is not a big eater, but he ate this pizza until he was nearly sick lol, then he polished off the rest of it for breakfast! Wow, you have a winner here, John. Thankyou for posting! I would love to feature this one on my blog called "Cooking Up A Storm All Over The World!" Do I have permission to re-post it? Glad you liked it Denise! This was great! We can no longer buy pizza from a store, because my husband is allergic to meat...and there is just too much "meat contamination" even if we get a veggie pizza....so this is a great substitute! To add a little more flavor I melted some butter and pressed some garlic and brushed it onto the crust....it was great! That sounds like a yummy variation Anne. Thanks for sharing! Awesome is right! This was really easy to make and is absolutely delicious. I added 2t Italian seasonings with the flour mixture and baked for 14 minutes. Top with caramelized onions, slliced black olives and mushrooms for a savory treat. So glad you enjoyed it Ilene. Thanks for the detailed and useful review! I've had caramelized onions with mushrooms, but not with black olives too. Will have to give that combination a try! Great recipe...used it to make cheesesticks...will use again! Thanks for the feedback and suggestion, Becki! This does sound awesome John! Will most certainly try! Thanks Patricia. I'm glad it looks good to you, and really appreciate you taking the time to add a review. The norm on CookEatShare is to rate recipes that you have tried...and just comment on (but not rate) recipes you haven't tried. That way people can really trust the ratings (e.g. it tastes good and doesn't just look good). Please don't delete this rating...but in the future it would be great if you would follow this norm. Great to have you a part of CookEatShare! Please keep the comments and reviews coming! Thanks for posting the review Mitch. Glad you enjoyed it! I can't wait to try this on my grandchildren. This looks wonderful. I hope you enjoy it Sandra! This is the best pizza dough i have made yet!! My mom said she really dont like pizza that much, but she loved the pizza i made with this dough. Thank you for this recipe. I love trying new pizza crust recipes.... Saving this one. I use cornmeal in mine also... :) Great recipes! Hope you enjoy it! Normally I don't rate a recipe (just comment on it) until I've tried it. I hope you'll update your rating once you've given it a try. i have tried it twice now and the second time i added a tsp. of basil and a tbsp grated parmesan cheese to the dough . and this was with a chicken ranch pizza. it was amazing. Each time I see your pizza dough on all the time favorites page I say I need to make it. This weekend I decided to make a couple of different breads (Foccacia & Italian Semolina Sunbursts) while my wife was out town; so it seemed appropriate to make your dough at the same time. I elected to freeze the dough for later use but liked the results of the proofed dough. I like the use of conrmeal--a different twist. The dough uses a lot of yeast hence a very fast rise. It is a very moist dough as well. I will let you know the final results after thawing and actually making pizza down the road. Thanks for sharing the recipe. I hope you enjoy this once you've tried it Bob. Thanks for the detailed review! 500 is too hot. my oven was smoking and pizza black after about 7 min. Always looking for good pizza! I have made this dough with almost the exact same recipe. Only difference is I have used highly active yeast and didn't need to let the dough rise... just knead, shape, add toppings and bake! Super easy! Of all things, I've never made my own pizza dough, but I want to start, so this looks like it will be a great starting point to try my luck at it. I hope you love this Janice and it lives up to your 5 heart rating! If not, please come back and remove some hearts. Thanks for this easy pizza dough recipe! I made pizza with your dough this weekend. Very tasty. I made a classic Margarita and a chicken with pesto and articholke hearts. Both turned out great. I baked them on a pizza stone for 12 minutes. The crust was crunchy on the outside and chewy internally as you just. A nice formula. Thanks for sharing! John: I made pizza with your dough this weekend. Very tasty. I made a classic Margarita and a chicken with pesto and articholke hearts. Both turned out great. I baked them on a pizza stone for 12 minutes. The crust was crunchy on the outside and chewy internally as you just. A nice formula. Thanks for sharing! Hi John, this sounds like a winner. We are currently in the process of building our own wood fired pizza oven here in Texas. I can't wait to try this. Thanks and have a great day! Thanks for the comment, Lyla. Hope you enjoy it! thanks for the invitation to be one of the invited friend. . . .
Hello John. Thanks again for sharing. I make my own dough and different breads all the time as I like to know what exactly goes into it. I use the bread machine on the dough recipe, little easier on the wrists and hands. Nothing like the smell of dough to me and of course the end results. Going to give this a try. I love to pressure cook a smoked pork hock till meat falls off the bone. Use a fresh pineapple, fresh mozzerella, tomato paste, parmesean, black olives VOILA ham & pineapple deluxe. Hello John. Thanks again for sharing. I make my own dough and different breads all the time as I like to know what exactly goes into it. I use the bread machine on the dough recipe, little easier on the wrists and hands. Nothing like the smell of dough to me and of course the end results. Going to give this a try. I love to pressure cook a smoked pork hock till meat falls off the bone. Use a fresh pineapple, fresh mozzerella, tomato paste, parmesean, black olives VOILA ham & pineapple deluxe. Cheers! Hi Sheila...thanks for the note. Sure hope you'll put the pressure cooker pork hock recipe up for us to try. Sounds fab! i live inSouth Africa and "corn meal" is not familiar to me - what exactly is that? Cornmeal is flour ground from dried maize or American corn. It is a common staple food, and is ground to fine, medium, and coarse consistencies. In the United States, the finely ground cornmeal is also referred to as cornflour. However, the word cornflour denotes cornstarch in recipes from the United Kingdom. I think you'll like it Annie...and it's pretty fun to make once you get the hang of it! Hi Janis...I think it's to avoid conflict with the flavors in the toppings and sauce. But give it a try and see what you think! 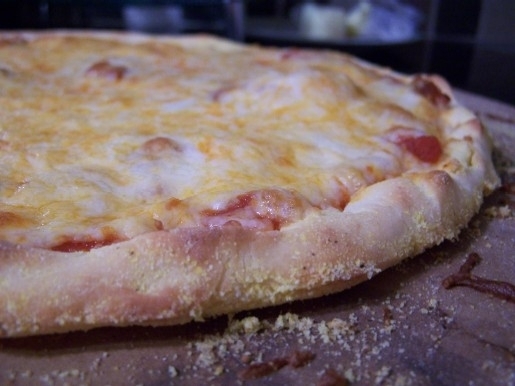 This pizza dough recipe looks delicious--so good, in fact, that we shared your post on the Montillo Italian Foods' Facebook wall. Nicely done! Thanks for the comment and for posting to facebook, Deena! Love homemade pizza dough. This one looks good! I learned a great trick from "Saveur": Put your pizza stone in the oven at 500 degrees 1 hour and you create your own brick-style pizza oven environment; however, I can only go as high as 450 or my oven shuts off after 45 minutes. I will try your recipe with this technique. Love homemade pizza! Thanks for the great tip, Eliot! John, I haven't made homemade pizza in years and have been looking for a great recipe for the dough. I think I've found it with this one! It sounds easy and I love that it is crunchy but also chewy. I will be trying it soon! Your recipe sounds great. It's so much fun to make homemade pizza. I like to make mine healthy by using reduced-fat cheeses and a small amount of regular fresh grated parmesan cheese! I have been on a quest for the perfect pizza dough for my grill which is the ceramic charcoal so it really acts as a wood fired flavor. I always make my own and will try your recipe next. Made a chicken apple sausage, sweet onion, and gruyere pizza last night on the grill that was fabulous. Look forward to hearing how you like it Shawna. And when you narrow down on your favorite crust, I hope you'll post your recipe! Do you use a pizza stone? Sorry for the delay, Paula. I missed this one. Yes, I use a pizza stone normally. I gave you credit for it and linked back to this page. Thanks again. 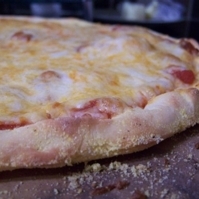 I adapted this recipe to be gluten free and cut it down to make just one 12" pizza crust. The result was a very good thin crust pizza. My better half was pleased. thank you so much for sharing this recipe. Here is a link to what I did with it. http://theglutenfreespouse.blogspot.com/2010/05/gluten-free-pizza-dough.html I gave you credit for it and linked back to this page. Thanks again. Marianne...thanks for the link. That recipe looks super easy. I don't mind the tossing and punching, but I can imagine times when it would be very convenient to have a lower effort alternative. Hope to see more of your recipes. Sounds like a great recipe...super simple! My daughter has wanted to make homemade pizzas lately, so maybe for the games tonight I'll try it! from the the way your describe it sounds a good dough. i will give it a try. I've tried several doughs without being thrilled. Maybe yours will be the charm! Thanks, John! I made this pizza dough tonight, I wasn't quite like I expected, but we both loved it here!